Did you know that up to 75% of Americans have some form of dental anxiety? Even celebrities like Jennifer Aniston, comedians like Kevin Hart, and championship athletes like LeBron James deal with fears about dental care. Although this condition is remarkably common, many people with dental anxiety avoid going to their oral healthcare professional until smile issues require advanced treatment. Since we’re dedicated to a compassionate approach to every patient we see, Fossum Dental Group can help with sedation dentistry in Temple. Learn more about their safe, effective options in this post. What Sedation Dentistry Treatments Does Your Practice Offer? As your trusted dentist in Temple, Dr. Richard Fossum and Dr. Brooke Elmore treat each patient with the warmth, kindness, and respect they give their own family members. Their friendly and welcoming personalities make the entire process easier, especially opening up to them about anxiety surrounding treatment. They offer the following options to set patients at ease. Nitrous Oxide or “laughing gas,” is a sweet tasting gas that you’ll receive through an inhaler placed over the nose. Simply breathe in, and let the medication relax you within seconds. This is a great method since it takes effect almost immediately, and wears off just as quickly once stopped. You’ll have no “hangover” effect and can return to work or school the very same day – and, you’ll be able to drive yourself both to and from appointments. In this method, patients take a small pill by mouth before they come to the office for their appointment, and then another small dose once they arrive. The medication will make you extremely relaxed, but you’ll still be able to respond to commands from our team, and it’s common for patients to feel so comfortable they fall asleep during treatment. You’ll need to arrange for transportation both to and from your visit, since the medication will make you groggy and cause issues with operating a vehicle. We recommend scheduling your appointment in the afternoon, since you it’s best to just head home and relax as the medication wears off throughout the day. You’ll be able to return to work or school the next day with no issue. With this modality, sedative medications are given to our patients intravenously. You’ll be in a “twilight” state, and (as with oral conscious sedation) you may be so relaxed that you drift off to sleep. It’s also common for patients to experience partial or full memory loss about the treatment, which makes the idea of a traumatic experience nonexistent. We’ll monitor your vital signs constantly to keep you safe and secure the entire time you’re undergoing your procedure. 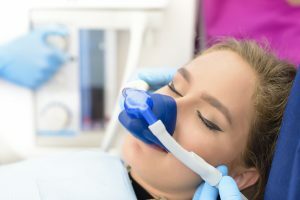 With general anesthesia, you’ll need someone to drive you to and from your appointment, and to keep an eye on you at home as you recover – and, you’ll need to take the entire day off work or from school. So, if you’re afraid of the dentist, you’re in good company! Remember that this affects three out of every four people you meet, and that we are committed to giving you the quality dental care you deserve in a relaxing environment. There’s nothing to be embarrassed about, so give us a call with questions or schedule your appointment with Fossum Dental Group today!